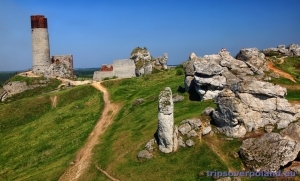 When going from Częstochowa towards Szczekociny, it is impossible to miss the stone ruins that dominate the landscape. They are beautifully integrated with the calcareous rocks of the Kraków-Częstochowa Highland. 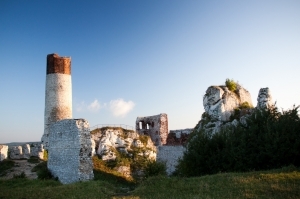 According to researchers – archaeologists and historians, Olsztyn Castle has seen the entire history of Poland, from the time of the last Piasts to the decline of the First Polish Republic. Furthermore, the Castle has been used as a cinematic setting for Polish movies. The unique settings of the castle hill and the surroundings were chosen by great directors to shoot famous movies such as "The Manuscript Found in Saragossa" by Wojciech Has, "The Countess Cosel" by Jerzy Antczak, "Polonia Restituta" by Bohdan Poręba, and "Demons of War" by Władysław Pasikowski. The history of Olsztyn Castle became a background for the painting entitled "Maćko Borkowic goes down into a starvation dungeon" by Jan Matejko. Out of all the strongholds on the Trail of the Eagle's Nests, the oldest history of Olsztyn Castle is probably the best explored. By the Upper Palaeolithic, i.e. 40,000 years ago, the castle hill had already been inhabited by people as indicated by archaeological excavations. According to the first written records, a wooden town had already existed here by the 11th century. 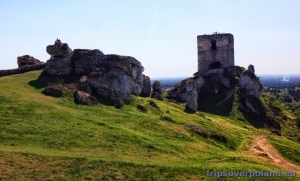 During the 13th century a stone watchtower was built in its place, it served a defensive and residential role. The building was to defend merchants who roamed a trade route from Lviv, through Cracow, to Wrocław. 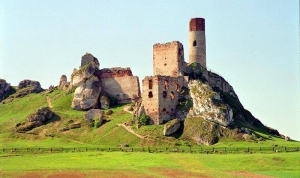 Olsztyn stronghold is an example of a Gothic upland castle; calcareous monadnocks and free-standing rocks, which were formed by erosion, were incorporated into its structure. Solutional caves were also incorporated into the building. 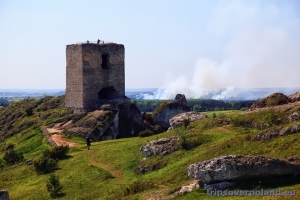 All this makes Olsztyn stronghold a cave castle. The oldest part of the architectural complex was the upper bailey of the total area of 500 square metres. It was built on an uneven square. Its main element was a 20-metre bergfried, i.e. a tower. The round lower part was made from hewn stone and the octagonal upper part was made from brick, so the tower resembles a factory chimney. One could enter the tower through a special bridge because the doorway was at the height of eight metres. This solution was intended for defensive purposes as it was the last line of resistance against the enemy for the residents of the Castle. The basement served as a starvation dungeon, where convicts were put. The first part of this article mentioned such a convict. The highest part of the stronghold was a residential tower house in the north. It was connected to a spacious cave at the foothill. The cave was used as a food storehouse or an arsenal. The residential building was the seat of starosts, who stayed there temporarily, and deputy starosts, who lived there permanently. The building housed the chapel that was mentioned earlier, a treasury, and rooms for officials. The entrance to the upper bailey led through three gates in the interior wall that surrounded the entire upper courtyard. There was also a tank for rainwater. Since the environment was not polluted at that time, the rainwater collected in that way was used as drinking water. If there was the upper bailey, there had to be the lower bailey. Of course it could be found at a lower level and it served as a utility courtyard. It was surrounded by a defensive wall, which was two metres thick. The utility buildings and the residential rooms for castle servants were integrated into the bailey. During the early 16th century, a south-western outer castle was additionally sectioned off. It was surrounded by a 250-metre long wall. 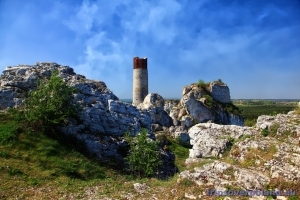 The range of the walls was outlined by a square tower known as the Starost’s Tower or the Village Leader’s Tower. The Tower was a landmark which outlined the outer castle since it was about 300 years older than the outer castle. It had already stood here by the 13th century, which means that it is the oldest brick building of the castle complex. There was an entrance gate at the base of the Tower. It led to the outer castle, where traces of bloomeries, i.e. furnaces used for smelting iron ore or producing steel, were found in the 1950s. There were smithies next to the bloomeries. The craftsmen who established a servient settlement for the stronghold lived outside the walls of the outer castle. The layout of the upper bailey was slightly changed during the 16th century. 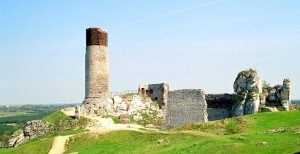 The Gothic Starost’s House was rebuilt, brick tops were added to the towers, so they reached the height of 26 metres. During its golden age, the entire complex covered an area of 12,000 square metres and was one of the biggest complexes in the entire region. 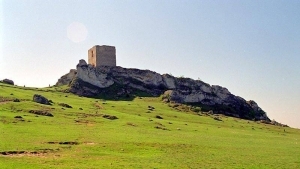 Vast parts of the upper bailey with a cylindrical tower and ruins of the walls of the residential buildings as well as the tower known as the Village Leader’s Tower or the Starost’s Tower, which stands on the opposite side, remained to the present day. The borders of the lower bailey and the outer castles, which are marked by a low calcareous wall, are clearly visible. The building from which you can easily see the towers of the Jasna Góra Monastery overlooks the entire village. It stands on the ridge of a stone hill known as the Sunny Rocks. The Tower is part of the Common Land mentioned above. For a small fee you can visit the buildings and enter the Village Leader’s Tower. During the autumn of 2015 archaeological excavations were conducted. They resulted in many interesting findings and new interpretations of the Castle’s functionalities. The archaeologists made new findings during the archaeological work. Traces of three pillars of the bridge, an outline of the Gate Tower and the lower floor of the Well Tower were revealed. The excavations made it possible to find out what the stronghold looked like during its golden age. The researchers suspected that the bridge on the north side led to the upper bailey. The last excavations confirmed these assumptions. Thanks to this work we know more about the appearance of Olsztyn Castle during its golden era. The location of the three pillars of the bridge, which led from the Gate Tower to the upper bailey, was found. The bridge ran along the recently renovated wall. At the height of the third pillar the bridge "bent" and led to the second gate at an angle, and from there, through another bridge, to the residential area. The archaeologists found the exact location of the Gate Tower, which had been on a small hill outlined by stone foundations. Based on an illustration from 1631, which very precisely described this part of the castle, the remains of the "Gateman’s Room" were found (the gateman was a man who controlled the gate). Based on these documents we know that the Gate Tower had several floors and was a large building with a wooden upward extension. The researchers also found the so-called lower bailey. This part was built during the 15th century and was probably extended during the next century, when Mikołaj Szydłowiecki was the starost of Olsztyn. 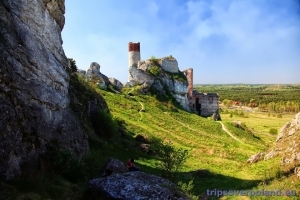 In the 16th century he turned Olsztyn Castle into a flourishing residence. The extension works included the so-called Well Tower, which is another part of the lower bailey. The walls survived until the present day. According to the surviving documents dated from the 17th century, there was a well in here. It was filled in. An excavation three metres deep was made to find it. It uncovered an unknown floor of the Tower. But that did not make it possible to go down to the level of the well. For this purpose, a GPR survey was conducted by Dr Wiesław Nawrocki from the Non-destructive Research Department in Cracow. The survey confirmed explicitly that there is a subsidence in this room, i.e. most probably the well mentioned in the seventeenth-century illustration. This interpretation has been confirmed by the boreholes. 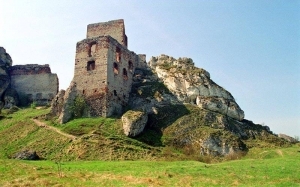 Unique on a European scale, Olsztyn Castle is an example of a rock and upland stronghold classified as a cave castle, and one of the biggest attractions of the region. 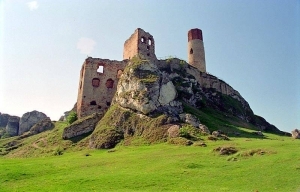 The ruins of Olsztyn Castle cover a hill which resembles a roost or a rock ridge that falls steeply to the south and ends with a rock precipice known as the "Sunny Rocks". The most interesting rock formations known as "Cirque" rise on the east part of the hill, curving softly. You can climb each of the monadnocks if you have a specialist equipment. Climbers gave these rocks original suggestive names: "Eve's Porch", "Mushroom", "Wardrobe", "Yellow Pillar" or "Virgin". The famous Polish Himalayan mountaineers Wanda Rutkiewicz and Jerzy Kukuczka polished their skills on these rocks. There is a desert where you can meet an original and rare bird – the sand curlew – to the north of the Castle. This sandy bird is migratory, it spends the winter in North Africa and Turkey. It is protected by law in Poland, where it builds nests and brings up its offspring. It always chooses places like the surroundings of Olsztyn Castle. You can visit the ruins every day from 9.00 a.m. to the twilight.